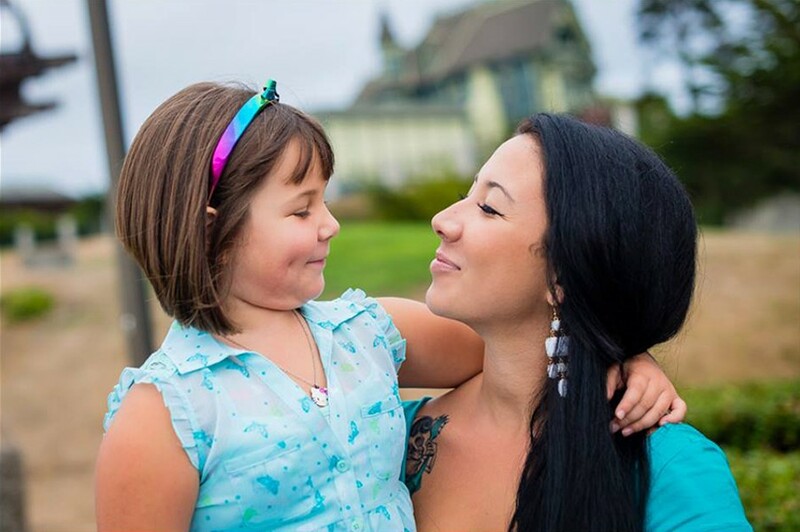 Photo by Humboldt Photography Ivy and her mom, Sherae O'Shaughnessy. My journey into parenthood has been strange and trying, but absolutely fulfilling. From infancy, my daughter, Ivy Pearl, was remarkably quiet and detached. In retrospect, this was not just good karma for my difficult pregnancy. As she grew older, she would have meltdowns if she was wet or dirty. At an age when most toddlers begin to develop their speech and language skills, Ivy was still moaning and pointing. I was exhausted. I felt overwhelmed, incompetent and alone. In the winter of 2010, my husband was away for weeks at a time, training for a deployment to Afghanistan. All of my family was 800 miles away in Southern California. Ivy was 3 years old, and we were inseparable, but we didn't spend a lot of time around other moms or children. In our isolation, I thought she was normal. Difficult, but normal. Then one day that winter, during our regular trip to Ross Park in Eureka, we encountered another mom and her two young sons. One of the boys was Ivy's age and severely autistic. His mother (very aware of the signs of autism) asked about Ivy's diagnosis. I was stunned. All of a sudden, it all made sense. Duh, Sherae! The kind mother that we met that day, I am quite certain, was placed in my path to help me find the resources I needed to help Ivy and those in her life. Luckily, Ivy was at a perfect age to be diagnosed and begin therapy. After close to a year of working with various doctors and therapists, she was diagnosed with "pervasive development disorder not otherwise specified." Meaning she has some but not all signs of autism, and she is on the high end of the spectrum. This is the best a parent could hope for in these circumstances. When I first realized that Ivy might have a learning disability, I was devastated. So many obstacles to hurdle, so much disappointment, so many unanswered questions. Since then, I've encountered many parents who felt the same way — at first. It is instinctive to want to protect your children and to bear burdens for them. I never wanted Ivy to have to struggle or feel different from the other kids. I felt I had failed her somehow. And worse, her paternal family wasn't completely accepting and supportive of the news. It was emotionally taxing, but I didn't have the luxury of being exhausted if I was going to see her through. This was the time to bite down and muscle through. My eye was on the prize; Ivy getting the help she needed so she could go to a regular kindergarten in a school of our choosing, with little to no help from outside sources. This was the light at the end of our tunnel. For many months, we endured countless home and office visits with occupational, behavioral and speech therapists. Individualized Education Program (or IEP) meetings with case workers, school officials and doctors. Tantrums when it came time to work on home studies. Often, I felt isolated and hopeless. Then one day, something changed in Ivy. She was calmer and more compliant. Her vocabulary expanded before my eyes. As she felt confident in her ability to communicate, she didn't need the meltdowns. I can remember like it was yesterday the exact moment when I realized it had all paid off. During a particularly rough day filled with meltdowns and frustration, meltdown number four began when Ivy couldn't fit her Big Wheel through the sliding glass door. The solution was obvious — open the door wider! But to her, it was the end of the world. Everything in me wanted to go into my bedroom and put the "Do Not Disturb" sign on the handle. Instead, I took her hand to calm her and showed her how easily we could fix things. She stopped the fussing, pushed the door open another inch or two and the Big Wheel passed through with ease. Then I asked her if she'd like a cookie, and she replied, "No thank you, I don't want a cookie." Progress! We problem-solved. A complete sentence that included a polite, "No thank you." Be still, my heart. My little Hotdog was going to be just fine. Today, I'm 28 and Ivy is 6. I'm a comedian, emcee, freelance writer, wife and mother. Ivy has just entered first grade. She still needs one-on-one time with a speech tutor, but her math and science comprehension are quite advanced. We spend a lot of time laughing with each other. I believe her inability to speak all those years taught her to observe and listen. She is incredibly compassionate and affectionate — a page I should take from her book. If you ever feel that there may be something different about your young one, do not despair. We are fortunate to live in a community that is ready to rally round and help. Do not default to self-loathing or blame. We are all individuals for good reason. I am grateful for Ivy and all the things she is. I am even grateful for the years of struggle. Sincerely. Without them I probably wouldn't appreciate all of her little milestones now. As one of the columnists for the North Coast Journal's new "Offsprung" column, I look forward to sharing the journey that Ivy and I are taking. For now, take a minute to appreciate how exceptional your own offspring are. We are fortunate to know them. Sherae O'Shaughnessy lives in Eureka. If you'd like to write for "Offsprung," contact Jennifer Fumiko Cahill at Jennifer@northcoastjournal.com.